There will be three (3) free gameday trolleys - one to Newark Penn (yellow), one to Ironbound (red) and one to Newark Broad St. (blue). Additional loyalty points will be granted for attending weekday games. The loyalty point feature will link to the Season Ticket "Smart Cards." You will be able to load money on to the cards and use it to buy concessions, bypassing the need for cash. Season ticket holders will also receive loyalty point credit depending on how many games they attend, as well as other Red Bull Arena events. The "Never Waste a Ticket" program is back, but only on a limited basis. 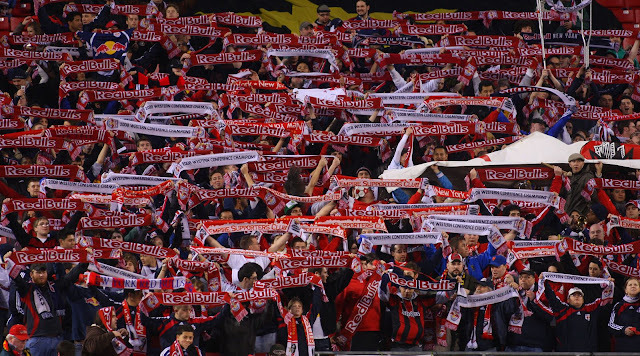 Red Bull fans can exchange unused tickets only for the home games against Chivas USA, Toronto FC and Kansas City Wizards. Please note, however, that you cannot exchange tickets for a match that you already missed. You need to do it BEFORE the match you expect to miss. Youth Season Ticket holders are automatically enrolled in Red Bull Fanatics Fan Club. The club is also encouraging fans to bring the scarves to every home match and hold them up during the team procession at the beginning. There will be an Interactive Zone on 6th Street and a Beer Garden right next to it (for fans 21 and older). The Beer Garden will open 3 hours before kickoff. The literature inside the package states that Meet The Team Day will take place on April 24th, immediately following the match against the Philadelphia Union. This event, which will benefit Seth Stammler's Sporting Chance Foundation, will include a 2 hour open bar and chances to win various raffle items. The cost will be $25 in advace or $35 at the door. The club announced that it will hold its annual Media Day on Tueday, March 16th from 1-3pm (and I'm still waiting for my invite RBNY :). The first team will practice, for the very first time, on the majestic Kentucky bluegrass pitch that same day (starting at 10am). 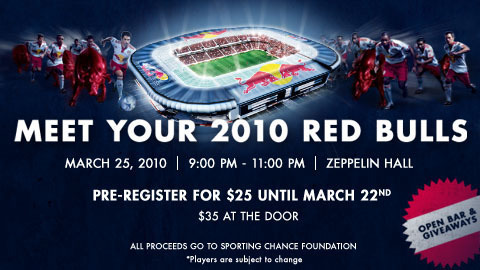 Finally, here's another interesting event involving Red Bull Arena.